Conducted by Christopher Hogwood, The Academy of Ancient Music performs Wolfgang Amadeus Mozart’s Symphony No. 16 in C major, K. 128. 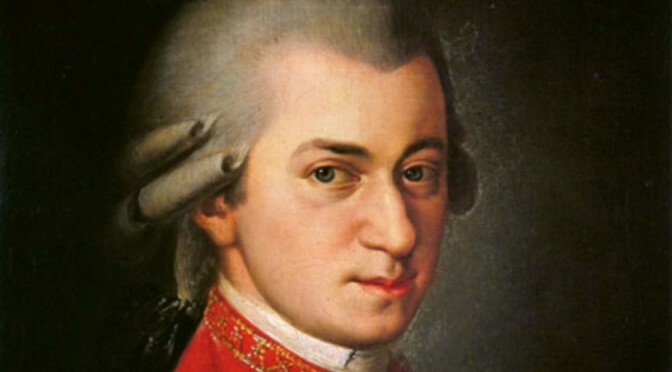 This symphony is one of many written during the period in which Mozart stayed in Salzburg, between two trips to Italy. It is the first of three symphonies composed by Wolfgang Amadeus Mozart in May, 1772, when the composer was sixteen years old. Allegro maestoso, 3/4 The first movement, which a C major essay in sonata-allegro form, sounds at first to be in 9/8 due to the presence of triplets. However, as it enters the second half of the exposition section it becomes clear that the movement’s meter is actually 3/4. The development section is short, but filled with dense modulations. Some of this developmental spirit carries over into recapitulation, which turns out not to be perfectly literal. Andante grazioso, 2/4 The oboes and horns drop out of the second movement, which is another essay in sonata-allegro form, written for the strings alone. Allegro, 6/8 The oboes and horns return, in C major, which is a cheerful dance cast in an altered rondo form, with a coda.